When what you want is not available. 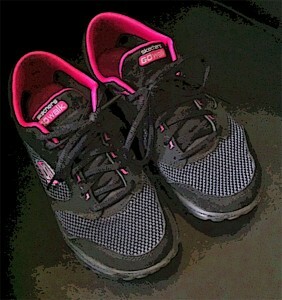 I fall in love with some brand items, like my walking shoes from Fila. The next thing I know they are worn out. I go to get a replacement pair and they no longer have them. Fortunately, I was able to get them to transfer the last pair in my size from another location. They said it could take up to three weeks; not good enough when you walk every day. Luckily they came in within a week and I was back in stride. Then once again, I wore them to a thread and had to repeat the process. Ugh! They had none. The shoe was officially redesigned and not to my liking. Although they looked similar, they did not have the walking-on-air fit I wanted. I had tried them before in desperation. They immediately caused blisters due to the heel spine up the back. Chalked up as an expensive mistake, they are still in the box destined for donation. Walking every day my shoes wear out pretty quickly. I had waited too long to replace them and needed something now. Not tomorrow—now! It was semi-traumatic. I get used to my shoes; they are my trusty companion, a part of my everyday life. A comfortable extension of me. They form-fit my gait. Now comes the switch. I have to change brands instantly. I choose my new shoe brand feeling a sense of loss. I identified with my Filas and am forced to leave my brand loyalty behind. In with the new—no looking back. Fila lost a customer and Sketchers gained a new brand evangelist. Shoes are very personal. I generally choose low-key colors and styles with minimal brand identification. Uh oh! These had fluorescent pink trim accents with their ‘S’ logo branding on both sides, plus the tongue messaging, ‘Sketchers Go Walk’. The mid-outsole side dons the Resalyte Technology name. They were the only pair left in my size and on sale; 7’s seem to go quickly. I caved and bought them. As soon as I put them on I loved them. No breaking them in; they were perfect from the first step. They felt like they were custom made for me. As for the neon pink accents—surprise!—they make me happy to see their bright lights in action and put a little more pep in my step. I did not go all the way and switch out the black laces. They give you both options, a nice bonus—two pair of laces with your shoes. Black and hot pink. Choice is always an excellent personal touch from my perspective. The pink laces would have been overkill for me, but someone else might love them. What might have never happened did, when my brand of choice left me no option but to move on. Some brand loyalty gets in the way of finding other products and services you may enjoy even more. In this case, a lot more. Perhaps brands should ask customers before they make formulation or style changes. No one needs brand blisters. Social media is a perfect opportunity to test the waters in the wake of change. Retaining loyal customers is easier than finding new ones and, with so many options to choose from, in some cases, one blister is all it takes for a customer to walk away. I was a Fila, now I’m a Sketcher, and my memory foam has adapted. Check out this product description to find out just how great these shoes are. Seriously, once you read this, you will want these shoes. They live up to every promise. Including no stinky feet!